Parkinson’s description: About 60,000 new Parkinson’s cases will be diagnosed this year in the USA; joining the 1 million people currently living with this disorder. Parkinson’s typically presents in older adults (an important subset of cases are early onset in age), mostly as a movement disorder with some leading to cognitive disorder/dementia. The typical presenting symptoms of Parkinson’s include rigidity, slowness of movement, postural instability, and resting tremor. Additional clinical features of Parkinson’s may develop including mild memory difficulties, swallowing problems, sleep disorders, speech difficulties, and constipation. Brain circuits go awry without dopamine: Parkinson’s begins following the dysfunction/death of dopamine-generating neurons in the mid-brain region called the substantia nigra. Dopamine is a neurotransmitter released by the brain that plays a number of roles, including: movement, memory, pleasurable reward, behavior and cognition, attention, mood, and sleep. The message that dopamine provides is a focused, direct, immediate signal to various regions of the brain for smooth direction of movement and augmentation of the memory of all of these above physiological functions. With less and less dopamine these signals are dysfunctional and go awry, leading to the slow response and other symptoms of Parkinson’s. Think of it this way, our neural network is a ‘post office’. Dopamine allows for the correct zip code to quickly and accurately deliver letters to their appropriate address. Without dopamine, the zip code on many of the letters is wrong or missing numbers. Thus, with reduced levels of dopamine, the post office (neural network) is either slowed in delivery or letters are held-back for further review. “All we want are the facts, ma’am” (Jack Webb’s ‘Joe Friday’ character from the TV show, Dragnet): The characters to this episode are the nuclear receptor named Nurr1 and some current drugs used to treat malaria (Chloroquine and Amodiaquine). Okay, so how does this advance our understanding of Parkinson‘s? Here’s how. •Nurr1- Nurr1 is a nuclear hormone receptor. Nurr1 helps in the growth and survival of neurons that make dopamine. In a mouse model where Nurr1 was deleted, dopamine-producing neurons did not develop. Additionally, others have shown that Nurr1 is anti-inflammatory in the central nervous system; Nurr1 specifically protects neurons that make dopamine. These results imply that if we could discover drugs (compounds/chemicals) to engage or activate Nurr1 in the mid-brain substantia nigra, we might be able to generate more neurons that make dopamine. Engaging Nurr1 could potentially create an anti-inflammatory environment, which might protect remaining neurons making dopamine. Thus, targeting Nurr1 for treating Parkinson’s is a good idea. •Anti-malaria drugs- Scientists from Malaysia and the USA screened existing FDA-approved drugs for their ability to engage/activate Nurr1. 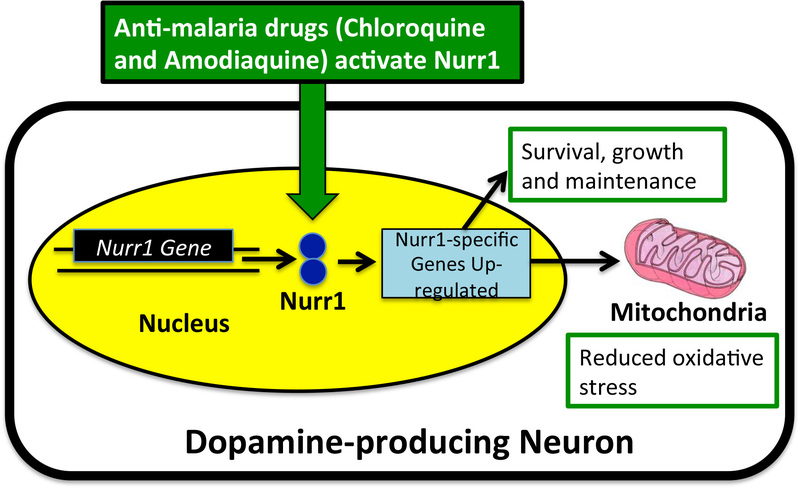 After testing ~1000 compounds, they found two existing anti-malaria drugs (Chloroquine and Amodiaquine) were able to target Nurr1 for possible use for treatment of Parkinson’s. There were 3 key findings in this paper: (1) these compounds enhanced Nurr1-specific genes in dopamine-producing neurons; (2) these compounds promoted a mid-brain anti-inflammatory response; and (3) using a rat-model of Parkinson’s, these compounds improved symptoms without any detrimental defects. These findings show that drugs can target Nurr1 in dopamine-producing neurons to provide a new/novel therapeutic strategy for treating Parkinson’s (hopefully, one day in the future). The drawing below summarizes these results. “Que sera, sera / Whatever will be, will be / The future’s not ours to see / Que sera, sera”: Clearly, there is real potential for future application moving from the rat model of Parkinson’s to one-day testing clinically in humans. This is the first step showing a ‘proof of principle’ that drugs are capable of targeting Nurr1 for possible Parkinson’s therapeutics. Only time will tell what comes of this exciting and interesting study. Stay tuned, stay hopeful, stay informed. Nanyang Technological University news release, accessed 17 July 2015. Thank you so much for your blog. I was diagnosed in Feb-May…in May,actually, since carbidopa-levodopa fixed my handwriting problem and stopped my left hand tremor. Our daughter lives in Raleigh and we have a condo in Southern Pines. Again, really appreciate your informative and inspiring blog.